Abigail and Stuart were married last November at St. Peter’s Catholic Church in Kirkwood. Abigail loved blush tones but wanted a pop of Merlot added in for a fall element. Here are some beautiful images of their wedding day by Jaimie Nicole Krause. 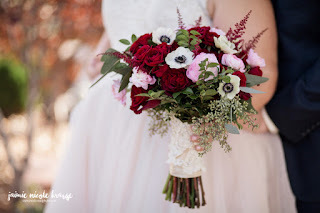 Abigail’s bouquet had all the bells and whistles- red astilbe, two kinds of Merlot roses, blush ranunculus, and white anemones with dark centers- all framed with textured fall greenery. We LOVED designing this bouquet! The maids carried these clutches of champagne and Merlot roses, blush stock flower and textured fall greenery. The champagne and blush tones played beautifully off of the maids’ dresses and gave a perfect backdrop for the pop of Merlot. This shot really shows the draping eucalyptus at the edge of Abigail’s bouquet. This is an example of how a non-traditional fall color scheme can still have a seasonal feel. All our best to the bride and groom! !